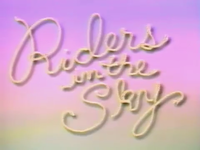 Riders in the Sky was an American live-action/animated children's television series starring western/comedy band Riders in the Sky. It aired on CBS in 1991. This webpage uses material from the Wikipedia article "Riders_in_the_Sky_%281991_TV_series%29" and is licensed under the GNU Free Documentation License. Reality TV World is not responsible for any errors or omissions the Wikipedia article may contain.